The share of electricity from renewable sources in the European Union grew again in 2018 and reached 32.3 percent - more than two percent points more than in 2017. New wind, solar and biomass plants displaced hard coal, consequently, EU total coal generation fell by 6 percent in 2018. The difference between hard coal and lignite is hue though as lignite generation fell only by 3 percent in 2018. Germany accounted for almost half of the EU’s lignite generation, which has been set a date to be phased out by 2038. In 2018, solar energy accounted for only 4 percent of the EU electricity mix, but solar additions in the EU increased by more than 60 percent to almost 10 gigawatts in 2018 and could triple to 30 gigawatts by 2022, as module prices fell by 29 percent in 2018. In northern Europe, solar generation peaked to record levels due to the very hot and dry summer in 2018. This helped to fill generation gaps as hydro, hard coal, wind and nuclear generation all stumbled. Despite the growth in photovoltaics of 10 gigawatts, the EU only has a share of less than ten percent of the solar world market, which last year comprised 109 gigawatts. The analysis by Sandbag and Agora Energiewende also shows that renewable growth must step up substantially. 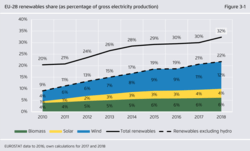 The EU’s 2030 goal of covering 32 percent of energy demand with renewable energy, requires the share of renewables in the electricity sector to rise to 57 percent by 2030, at the same electricity consumption itself is increasing. The reason: Large parts of the greening of transport and buildings will be realized through electric vehicles and electric heating, powered by wind and solar. This will be favoured by recent shifts of the operational costs of conventional power plants. In 2018, wind and solar power were for the first time comparable to existing coal and gas generation costs. Coal price rose by 15 percent, gas prices rose by 30 percent, and the CO? price rose by 170 percent in 2018. Consequently, wholesale electricity prices rose to 45–60 Euros per Megawatt hour through Europe. This is the level at which the latest wind and solar auctions cleared in Germany. “This means that the cost of renewable electricity is now similar or even below wholesale electricity prices in many countries," says Buck. The study "The European Power Sector in 2018" is available here and on www.sandbag.org.uk. It comprises 44 pages and contains numerous graphs and tables.